Coach Sergio Scariolo after the big win in Sassari: “We’re staisfied, it’s been a great game, against a great team and a great crowd. We approached the game correctly, with energy, no fear, nervousness or selfishness, we moved the ball, we defended like we stressed to do daily, during the week. Today we brought everything on the court. We showed a lot of composure, we fought as a team but we have to play like that every time. Instead sometimes we didn’t have the right approach. Now we have to play like that at home where often we’ve been less good. 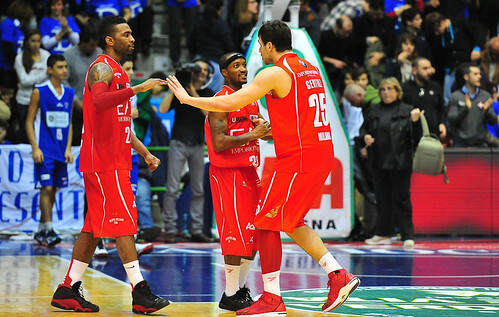 The game against Pesaro is the classic risky game but we have to have the energy we exhibited today. We didn’t shoot the ball well from three, just like Sassari. Now the defenses like to clog the middle and the easiest way out is to settle for a jumper. We made good choices but we didn’t shoot well. Easley is not lighter than our bigs, what really counts is being strong and many of the good opportunities we creates inside where the effect of our good work, we attacked to the rim or we kicked the ball out, sometimes scoring sometimes we didn’t. But we attacked with savvy and took good shots, with the only exception of a couple of minutes of rushed shots. We rebounded the ball well. We don’t have rebounding specialists but if you play hard you can overcome almost anything. We grabbed 11 more rebounds because of our energy and dteermination. Today we recpected ourselves because, from a basketball standpoint, we look better or we look worse based of the energy level”.